While I work to finish the production of the new ideas, we aren’t taking new pre-orders for the CGB Pattern Book Compendium or CGB, Volume III. If you like, read how CGB pre-orders work here, and why we value (but limit) their support. Pre-orders get us to press, but we don’t take funding beyond that limit. Pre-orders ship first when we publish a new book. It won’t be long now. Digital downloads of Volumes I and II are available from our online shop, and there are still a few paper copies of Volume II at my author site at Amazon.com. 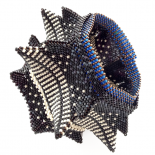 We appreciate ALL of the support and interest in our project as we have tried to follow every string, curve, and twist along the road of geometric and hyperbolic beadwork. You just won’t believe what we have to show you. inspired by ideas from Joy Davison (Jay Dee).